As smartphones have grown increasingly common in recent years, these devices have taken on a central role in the information lives of a substantial number of Americans. And yet, those Americans who rely most heavily on their smartphones as a gateway to online services and information are often the ones whose connections to their devices are most tenuous. This chapter of the report examines the general state of smartphone ownership in America today, with a focus on how these devices fit into the digital access options available to their owners. As in past surveys, smartphone ownership is highest among younger Americans, as well as those with relatively high income and education levels. Some 85% of Americans ages 18-29 are smartphone owners, as are 78% of college graduates and 84% of those living in households with an annual income of $75,000 or more per year. 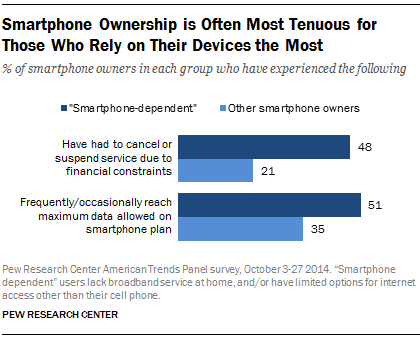 Ownership levels remain particularly low among seniors, as just 27% of Americans 65 and older now own a smartphone. However, this does represent an 8-point increase in ownership among seniors compared with early 2014. The ongoing monthly cost of smartphone ownership depends heavily on the type of plan one has. Some 29% of smartphone owners are on an individual plan (which includes pre-paid plans), and most of these users spend less than $100 per month on their cell phone bill: 34% of individual plan holders say that their monthly bill is less than $50, and 43% say that their bill is between $50 and $100. 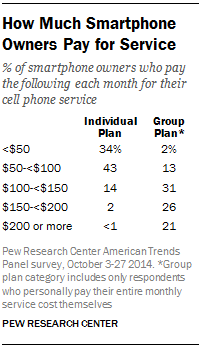 Just 2% of smartphone owners on individual plans pay $150 or more per month for service. For many smartphone owners, the ongoing cost of ownership can be a financial hardship: 23% have had to cancel or shut off their cell phone service for a period of time because it was too expensive to maintain. These financial challenges are especially common among lower-income smartphone owners, as fully 44% of smartphone owners with an annual household income of less than $30,000 have had to let their service lapse at some point or another. Along with lower-income users, African Americans and Latinos are around twice as likely as whites to have canceled or cut off their smartphone service, and younger smartphone owners are substantially more likely to have done so compared with older adults. Lower-income smartphone owners tend to subscribe to relatively low-cost plans covering only themselves as individuals rather than higher-cost group or family plans. 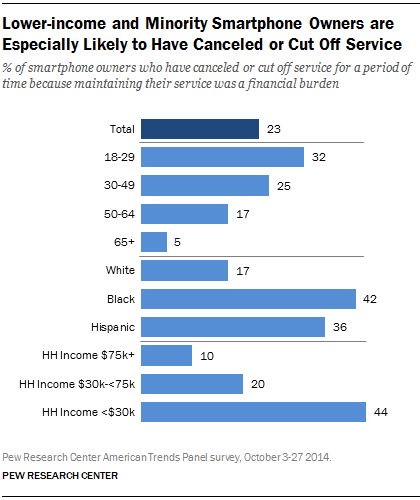 Accordingly, individual plan subscribers are around twice as likely to have canceled or cut back service as those on group or family plans (34% of individual plan members and 18% of family plan members have done so), and those with relatively low-cost plans are actually more likely to have canceled or suspended service than those with more expensive plans. Each of these issues impacts a fairly wide spectrum of smartphone owners, although certain groups do report problems with apps not working correctly at somewhat elevated rates. These include African Americans (55% of whom experience at least occasional problems with their smartphone’s apps), those with relatively low household incomes (52% of those earning less than $30,000 per year experience this), and those younger than 50 (half of smartphone owners ages 18-49 have at least occasional problems with apps, compared with 39% of those 50 and older). 9% experience unexpected charges from in-app purchases at least occasionally. Just 2% of smartphone owners say that this happens “frequently,” and 60% indicate that this never happens to them. These financial and contractual limitations more consistently impact non-whites, younger users, and those with relatively low household incomes. Roughly one-third of African American and Latino smartphone owners experience much higher-than-expected monthly bills at least on occasion, and about one-in-ten indicate that surprisingly high bills happen to them “frequently.” Similarly, 43% of black smartphone owners, 49% of Latinos, and 48% of those ages 18-29 say that they reach the maximum amount of data they are allowed to use on their plan at least occasionally, with around one-in-five from each group indicating that this happens to them frequently. Many smartphone owners have ample options at their disposal when they need to go online: 85% have a high-speed broadband connection at home, 87% own a desktop or laptop computer, and 53% own a tablet computer in addition to their smartphone. At the same time, smartphones serve as a crucial connection point to the broader world of online information for many Americans. 10% of Americans own a smartphone but do not have any other form of high-speed internet access at home beyond their phone’s data plan. In all, 19% of Americans fall into one or the other of these categories, and 7% of the public indicates that both conditions apply to them — that is, they own a smartphone but lack any other type of high-speed access at home, and have limited options for going online other than their cell phone. 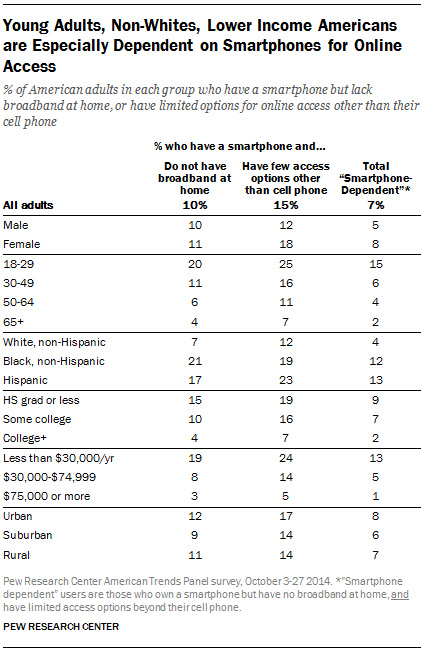 Throughout this report, we will refer to this 7% of Americans as “smartphone-dependent” users. Those with low household incomes and low levels of educational attainment — Some 13% of Americans with an annual household income of less than $30,000 per year are smartphone-dependent, and 9% of those with a high school diploma or less fall into this category as well. By comparison, just 1% of Americans from households with an annual income of $75,000 or more depend on their smartphone for internet access to a similar degree. Younger adults — Fully 15% of Americans ages 18-29 are heavily dependent on a smartphone for online access (20% of have a smartphone but not traditional broadband service, and 25% have a smartphone but have relatively limited options for going online otherwise). Non-whites — 12% of African Americans and 13% of Latinos are smartphone-dependent, compared with just 4% of whites. In addition to their demographic differences, these smartphone-dependent users also differ substantially from the rest of the smartphone adopter population in terms of the technology devices they own and financial assets they possess. Compared with other smartphone owners, they are less likely to own a traditional computer (50% do so, compared with 91% of other smartphone owners) or tablet (27% vs. 56%); less likely to have a bank account (63% vs. 91%); and less likely to be covered by health insurance (71% vs. 87%). They are also less likely to own their current residence, and more likely to rent or to live with a friend or family member. Perhaps unsurprisingly given their demographic profile, many of these smartphone-dependent users gravitate towards relatively low-cost plans: among those who pay for at least some portion of their plan, 27% say that their monthly bill is less than $50. But at the same time, many devote fairly substantial resources towards maintaining their cell phone service: 29% spend between $100 and $200 per month, and 5% say that their monthly bill is $200 or more. Even as a sizeable number of Americans indicate that their phone plays a central role in their ability to access digital services and online content, for many of these users this access is tenuous thanks to a combination of financial constraints and technical limitations. In terms of financial constraints, fully 48% of smartphone-dependent Americans have had to cancel or shut off their cell phone service for a period of time because the cost of maintaining that service was a financial hardship. That is double the rate among those who have broadband at home and/or ample alternate access options (just 17% of these smartphone owners have had to cancel or suspend their service). In addition, 30% of smartphone-dependent Americans “frequently” reach the maximum amount of data that they are allowed to consume as part of their cell phone plan, and 51% say that this happens to them at least occasionally. Each of these figures is significantly higher than those reported by other smartphone owners.